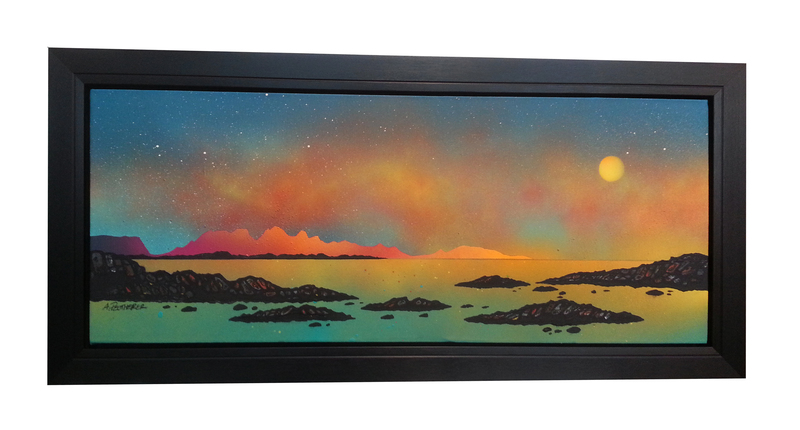 An original painting & prints of a summer glow over the isles of Rum & Eigg From Arisaig in a summer glow. Part of the Hebrides, a string of remote islands off the West Coast of Scotland from Arisaig. Prints produced from extremely high resolution, professional photographs of the original painting. An original abstract, atmospheric Scottish seascape / landscape painting. A mix of mediums are blended, layered, sprayed, scraped and splattered over the canvas to produce a very unique & atmospheric painting. The painting depicts the ever changing wild weather that constantly sweeps across Scotland’s West Coast, Hebridean islands & Highlands from The Atlantic. Painting of Scotland. The isles of Rum & Eigg from Arisaig, Hebrides, Scotland.